Dermaplaning is a cosmetic treatment to remove unwanted vellus hair, dead skin cells and promote cellular renewal within the epidermis. A medical aesthetician will use a surgical steel blade against the grain of the skin to remove dead skin cells, unwanted peach fuzz, blackheads and provide a physical and chemical exfoliation. The physical exfoliation comes from the blade, physically removing soft peach fuzz and dead skin. The chemical exfoliation comes from an AHA/BHA prep to open the pores and allow better exfoliation, as well as a post enzymatic mask to improve skin tone and texture. 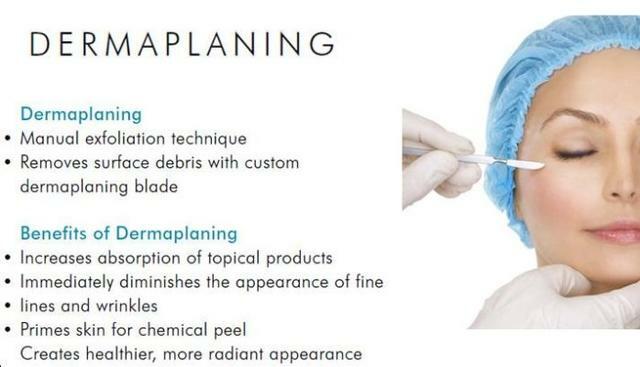 Dermaplaning can be performed as a stand alone treatment but can also be used in conjunction with a chemical peel. Dermaplaning post peel can give many more benefits to the skin, such as allowing deeper penetration of the peel, leading to rapid results in fewer treatments. There is no downtime following dermaplaning, however, the skin can be slightly flushed and sensitive following treatment. This should subside within minutes to hours and we suggest postponing retinol and exfoliants for 24hrs to avoid further sensitivity. Dermaplaning can be done at anytime on anyone with a few contraindications we’ll note during your consultation. It is completely safe, without any downtime, and can be performed on any skin type and skin colour. Results are immediate and last 4-6 weeks before the vellus hairs return and treatment is needed again. To learn more about this treatment or to book a complimentary consultation, contact one of our professionals at Beauty 2.0.